State funding for organizations that care for people with developmental disabilities isn’t keeping up with Arizona’s rising minimum wage, and the groups that contract with the state to provide those services are feeling the squeeze. Services providers that contract with the Department of Economic Security and the Arizona Health Care Cost Containment System say the state has underfunded them since the Legislature cut funding during the budget crunches of the Great Recession in 2009 and 2010. And though the state has increased funding to compensate for the higher minimum wage, the extra money hasn’t been enough to fully cover the costs, they say. In 2016, voters approved Proposition 206, which will increase Arizona’s minimum wage to $12 by 2020, which is about $25,000 per year. The minimum wage, which was $8.05 at the time of the 2016 election, is currently at $10.50, and will increase again to $11 at the beginning of 2019. That same year, voters in Flagstaff voted for Proposition 414, which will boost minimum wage in the city to $15 by 2021 — just over $31,000 a year — though voters may vote to rescind that requirement in November. In his agency’s budget request for the fiscal year 2020, which was submitted to Gov. Doug Ducey’s budget office in September, DES Director Michael Trailor asked for $16.5 million in permanent new funding for its Division of Developmental Disabilities to cover the cost of wage increases for its providers. Federal funding will cover about $37 million more. AHCCCS Director Tom Betlach is seeking about $2.8 million in state funding to cover those costs for his agency’s contract providers. That has been a major problem for the agency’s providers. Providers have already spent years trying to recover from budget cuts that the Legislature made during the Great Recession, which had never been restored. Now they must cope with underfunding for Prop. 206 as well. Dave Henderson, the CEO of STARS, a nonprofit that contracts with DES to provide disabilities services, compared the situation to a game of whack-a-mole. “We’re trying to fix one issue, and then all of a sudden this other one came up and caught us right between the eyes,” he said. The nonprofits and companies that contract with AHCCCS and DES provide a wide variety of services to people with developmental disabilities. Some provide what is known as attendant care at clients’ homes, which can include anything from fixing light meals and doing chores around the house to helping people dress themselves and bathe. If a person’s regular caregiver is gone, providers sometimes stay with clients. Some provide services in group homes, which can include social, recreational and leisure activities, as well as vocational training. 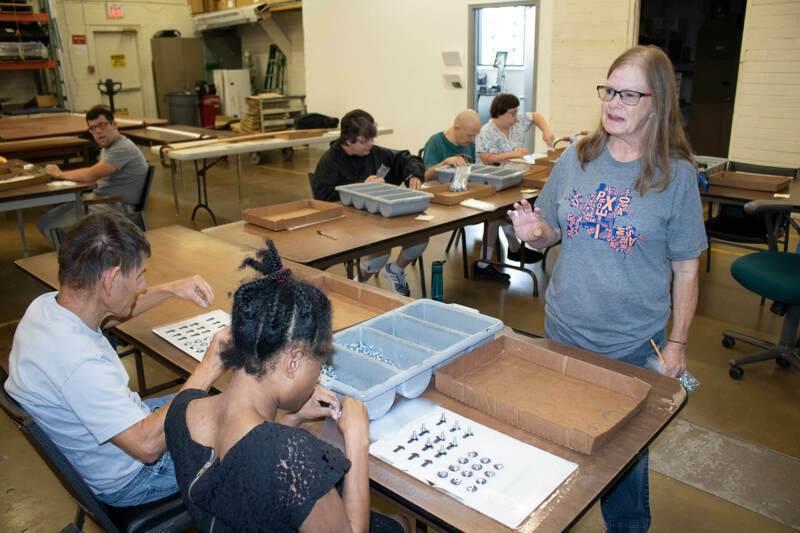 The Opportunity Tree, a nonprofit that assists adults with autism, epilepsy, cerebral palsy and various cognitive impairments at its facilities in Phoenix, Casa Grande and Maricopa, recently conducted a survey of its employees. As part of that survey, the nonprofit asked people why they would be most likely to leave. CEO Kelli O‘Toole said the employees are passionate about what they do. But most said low pay would be most likely to send them looking for a new job. Prior to the passage of Prop. 206, most disabilities providers paid above the minimum wage. But the rising minimum wage and inadequate state funding have made them less competitive, especially as the economy has gotten stronger. If providers can’t pay above the minimum wage, they simply can’t attract employees. And the new minimum wage creates pressure on wages for higher-paid employees as well. Griffiths said The Opportunity Tree has staffers who have been with the organization for five years and have gotten incremental raises each year. But now that the minimum wage has gone up, those veteran employees are making no more than new employees who just walked in the door. Some supervisors earn barely more than the people the supervise, and sometimes less when those lower-level employees work overtime. While other organizations might simply cut staff levels in response to compensate for a loss of funding, disabilities providers don’t have that option. Providers must abide by state-mandated ratios of employees per client. Henderson said day training programs, for example, are required to have one staffer for every 4.5 people they serve. As a result, layoffs aren’t really an option. The only employees who can be laid off are non-essential staff, who are often administrative. Due to the ratios, as the number of employees goes down, the number of hours each remaining employee works goes up. The resulting overtime pay creates another underfunded financial burden for the providers. Uncompetitive wages and a strong economy make it difficult fill open positions. The Opportunity Tree’s vacancy rate is double what it was in the pre-Prop. 206 era, Griffiths said. It has around 317 employees for its three campuses and other community-based sites, whereas, before the minimum wage hike, it would have had 340 or 350. CPES Novelles, an employee-owned company that contracts with DES to provide developmental disabilities services, hired a professional recruiter to help fill vacancies and created a central scheduling system to cut down on overtime. But those things cost money, said Mark Monson, the company’s president and CEO. “The margins are disappearing, if not totally gone,” Monson said. Unless they’re going to stop contracting with the state to serve people with developmental disabilities, providers must look elsewhere to make up for the lack of funding for Prop. 206. Some nonprofits have turned to outside fundraising, which is already a staple of the nonprofit world. Connie Phillips, the president and CEO at Lutheran Social Services of the Southwest, which contracts to provide services for AHCCCS’s Arizona Long Term Care System, said her organization already raises money for programs such as refugee resettlement, child welfare work, emergency services and homeless shelters. Now, it’s looking to ramp up those efforts to help with the unfunded Prop. 206 costs. Griffiths said The Opportunity Tree gets 99 percent of its funding from the state, but is now also looking at outside fundraising. STARS and The Opportunity Tree are also looking at grant funding. But Henderson warned that such “soft money” is an unreliable revenue sources because there’s no telling whether it will be there from year to year. Henderson said another option is to solicit tax-deductible contributions. He said the state in recent years has expanded a tax credit program, which allows people to make tax-deductible contributions to charitable organizations. But the program has expanded a lot in a short amount of time, opening up to more types of organizations, and Henderson said it’s still a bit confusing for taxpayers. “We have that opportunity to go out and raise funds that way, but it’s an educational process for us that takes time,” Henderson said. If providers can’t find new sources of revenue, they are often forced to divert money from other programs and services they provide. For example, Phillips said Lutheran Social Services is trying to expand its homeless shelter services into Surprise, where it’s partnering with local churches to provide people with places to sleep. But if it has to continue diverting money from its aging and disability services, it will have to scrap those plans, she said. The for-profit companies that contract with DES and AHCCCS don’t have the same options as nonprofits. They can’t fundraise from outside sources and aren’t generally eligible for grants. Monson said CPES Novelle, which operates in both Arizona and California, has been forced to divert money from its out-of-state operations to help cover costs here. “I hate to say the taxpayer in California is subsidizing Arizona, but they are,” Monson said. The nuclear option for providers would be to simply get out of the business of contracting with the state. Monson said CPES Novelle has already ended one of its agreements in Flagstaff, which led to the closure of three group homes and a day treatment center. The company was already “losing our shirt” by paying $13 an hour, and the pending $15 minimum wage simply wasn’t tenable. CPES Novelle has closed several treatment facilities in the Phoenix area as well. DES is looking for more money in the 2019 legislative session to help providers fund their Prop. 206-related expenses. But providers say the increased funding it’s asking for won’t fully fund those costs, just as it hasn’t in the past. According to the Arizona Association of Providers for People with Disabilities, the state budget for fiscal year 2018 included about $33 million in one-time funds for Prop. 206 and Prop. 414-related expenses, but it would have cost nearly $74 million to fully fund those costs. That figure includes overtime pay, wage compression and other employee-related expenses. “I don’t fully blame DES. They put in budget requests. I think they kind of try to stay politically neutral. It’s the Legislature,” Griffiths said. Daniel Ruiz, a spokesman for Gov. Doug Ducey, said the governor is working with DES and AHCCCS on its budget requests. But he wouldn’t say whether Ducey is committed to fully funding the cost of the Prop. 206-mandated wage hikes for providers. “We previously worked with them to fund increases and impact of Proposition 206, and will continue to evaluate this issue as we move forward in developing the executive budget,” Ruiz said. J.D. Mesnard, the speaker of the Arizona House of Representatives who is running for a seat in the state Senate, said the state’s intent has never been to shortchange providers. After Prop. 206 passed, he said providers brought a wide range of estimates to the Legislature, ranging from $20 million to $50 million. He said lawmakers believed they budgeted adequately for the minimum wage hike, but that a lot of guesswork went into it. Mesnard said developmental disabilities priorities will be at or near the top of the list of the Legislature’s funding priorities next session. Lawmakers are very concerned about the developmental disabilities community, he said, and have always been a major focus for the Legislature. But until he has a better sense of what the other priorities will be, and how much money the state will have to work with, Mesnard said it’s difficult to be more precise about plans to increase funding for priorities. “Obviously, priority is relative. We have a lot of needs that are brought to us that we prioritize. I don’t know very many services or providers of any kind that think the state is fully funding what it believes is necessary to fully fund them,” Mesnard said.